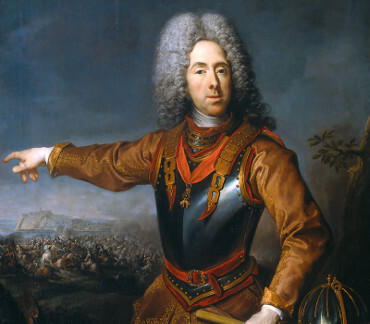 Prince Eugene of Savoy was a general of the Imperial Army and statesman of the Holy Roman Empire and the Archduchy of Austria and one of the most successful military commanders in modern European history, rising to the highest offices of state at the Imperial court in Vienna. Born in Paris, Eugene grew up around the French court of King Louis XIV. Based on his poor physique and bearing, the Prince was initially prepared for a career in the church, but by the age of 19 he had determined on a military career. Rejected by Louis XIV for service in the French army, Eugene moved to Austria and transferred his loyalty to the Habsburg Monarchy. Heerführer und Staatsmann (1663-1736). Mandat mit eigenh. U. 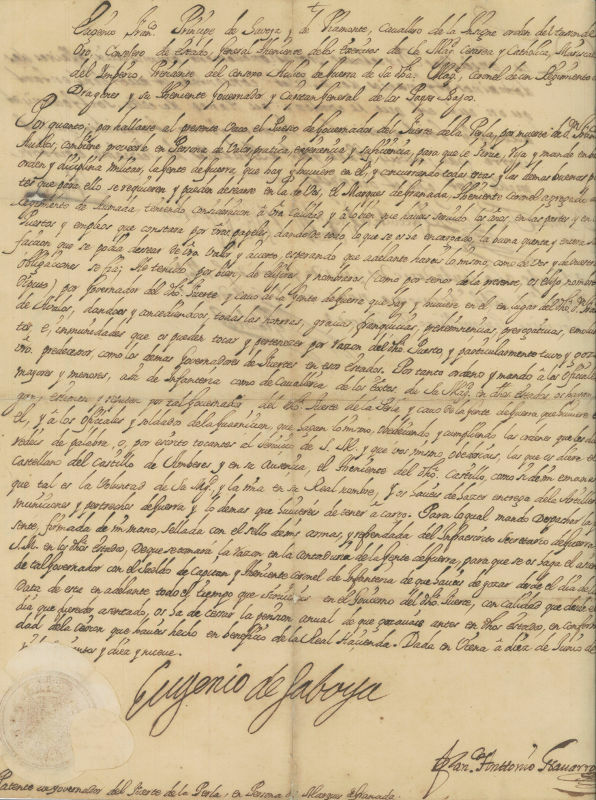 ("Patente de governador del Fuerte de la Perla"). Wien. 1½ SS. Gr.-Folio (400 x 313 mm). Mit papiergedecktem Siegel. 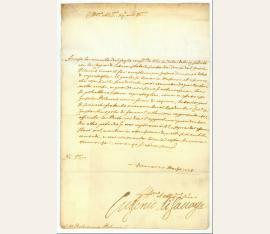 In spanischer Sprache, an den Marqués de Granada, aggregierter Oberstleutnant des Regiments Ahumada. 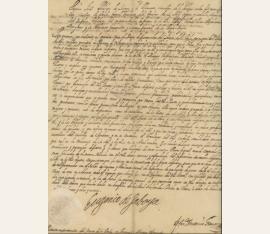 Ernennungsurkunde zum Befehlshaber der Antwerpener Festung De Perel (Fort La Perle, Fuerte de la Perla): "Por quanto, por hallarse al presente vaco el puesto de governador del Fuerte de la Perla, por muerte de Don Francesco de Avalor, combiene proveerle on persona de valor, pratica, experiencia y suficiencia [...] pueden desearse en de la vos, el Marques de Granada, theniente coronel agregada al regimento de Aumada, teniendo consideracion a v.a calidad y a lo bien que haveis servado los anos, en las partes y en los puestas [...]". - Etwas gebräunt und mit kleinen Randläsuren. Feldherr und Staatsmann (1663-1736). 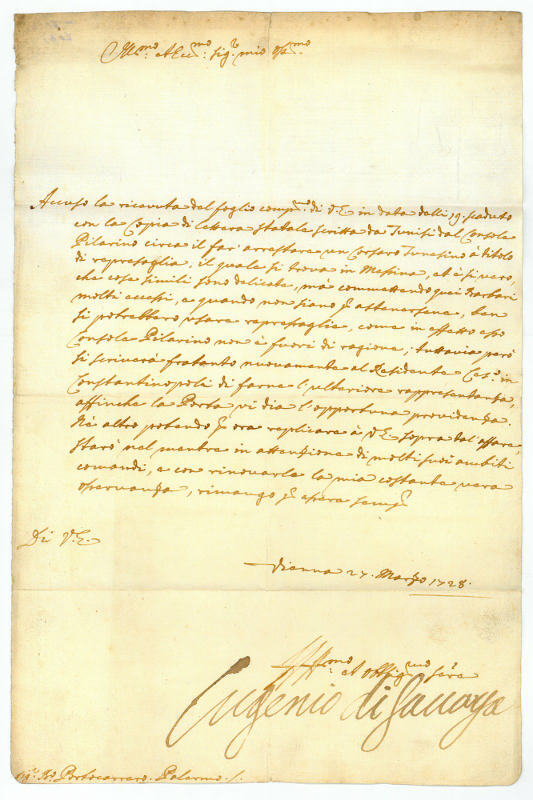 Letter signed ("Eugenio di Savoya"). Wien. 1 S. Folio. To the bailo (bailiff) Portocarrero in Palermo, discussing the delicate matter of arresting a Tunesian pirate in Messina, and the advice of Simon Pilarino (d. 1733), Austria's capable consul in Tunis: "Illustrissimo, et eccellentissimo signore mio osservantissimo. Accuso la ricevuta dal foglio comp.mo di Vostra Eccellenza in data delli 19 scaduto con la copia di lettera statale scritta da Tunisi dal Console Pilarino circa il far' arrestare un corsaro Tunesino à titolo di represaglia, il quale si trova in Messina, et è si vero, che cose simili sono delicate, suà commettendo quei Barbari molti accessi, e quando non siano per attenersene, ben si potrebbero usare repressaglie, come in effetto esso Console Pilarino non è fuori di ragione; tuttavia però si scriverà fratanto nuovamente al Residente Console in Constantinopoli di farne l' ulteriore rappresentanza, affinche la Porta vi dia l'opportuna providenza. Nè altro potendo per ora replicare à Vostra Eccellenza sopra tal' affare, staro nel mentre in attenzione di molti suoi ambiti comandi, e con rinovarle la mia costante vera osservanza, rimango per essere sempre di Vostra Eccellenza affettuosissimo et obbligatissimo servitore [...]". - Oriental matters were the precinct of the Imperial War Council, over which Prince Eugene presided, thus uniting the offices of Minister of War and of Foreign Affairs. The Tunesian corsairs were pirates and privateers who operated from the North African "Barbary Coast", in particular the ports of Algiers, Tunis, and Tripoli. In addition to seizing ships, they engaged in raids on European coastal towns and villages, mainly in Italy, France, Spain, and Portugal, capturing Christian slaves for the Ottoman slave trade as well as the general Arabic market in North Africa and the Middle East. Following the Treaty of Passarowitz, Emperor Charles VI had in 1725 entered into a Treaty of Peace and Navigation with Tunis: captured ships and their enslaved crew were to be released; navigation and use of ports was to be unrestricted for all Imperial subjects. The present communication is part of the larger context of an affair that would trouble Tunesian-Imperial relations for years to come: earlier that year, the corsairs had captured a Venetian ship (not protected by the 1725 treaty) which, however, foundered near Catania in a storm. Although the Tunesian crew were equipped with passports issued by the Imperial consul, the Sicilians stole their prize and arrested the Muslims, whom they subsequently sold as slaves - a breach of international law which, outrageously, found approval with the maritime court of Messina. To avert massive retribution by an immediate all-out corsair raid on Sicilian and Neapolitan ships and ports, Pilarino had to bribe his way to an audience with Hussein Bey and arrange a Tunesian mission to Vienna, where an envoy might formally put forth the Bey's complaints - a visit which eventually took place in 1732/33..